Morgan James Publishing, 9781683501435, 314pp. Excellence in Execution goes beyond anything available in the market in providing leaders what they need to succeed in becoming excellent in execution. Robin Speculand is a Global Pioneer and Expert in Strategy Implementation. He is the founder & CEO of Bridges Business Consultancy Int, creator of the Implementation Hub, author of four books on implementation (two became international bestsellers) and is publishing his fifth, Excellence in Execution - HOW to Implement Strategy. Robin Speculand is a Global Pioneer & Expert in Strategy Implementation and the founder of Bridges Business Consultancy Int. He is driven to transform organizations around the world by guiding leaders through their strategy implementation challenges. He provides them with the understanding, tools and templates to succeed where so many have failed. Robin's work begins as leaders are crafting their strategy and are starting to consider their implementation journey. As a sought-after global speaker at strategy and international business forums, his expertise has been featured in strategy journals, international print and electronic media including the BBC UK & Global, Channel News Asia, CNBC, Financial Times and Telegraph, and Singapore Straits Times. Robin has developed several proprietary tools including the Implementation Compass(TM), which identifies actions in the eight critical areas for Excellence in Execution. In 2013, he founded the Implementation Hub, the first portal in the world dedicated to strategy implementation. It features over 450 resources to support leaders in their implementation journey. He also had the first strategy implementation blog and app. He started Bridges, that specializes in strategy execution, after he left his position as Citigroup Regional Vice President, Corporate Bank, Asia Pacific, in 2000. Since first assisting Singapore Airlines as their first client, Bridges has helped governments, multinational corporations and local organizations across five continents achieve Excellence in Execution. This has led Robin to write five books, two of which have become international bestsellers, Bricks to Bridges-Make Your Strategy Come Alive and Beyond Strategy-The Leader's Role in Successful Implementation. 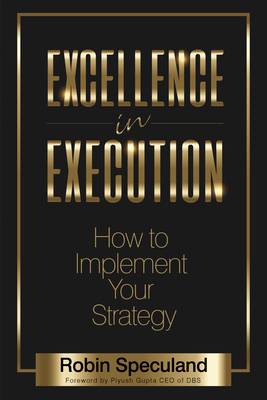 His latest book Excellence in Execution - HOW to Implement Strategy is shortly due for release. Robin earned an MBA from the National University of Singapore and serves as an adjunct professor at Singapore Management University and educator for Duke CE. He is a founding member of the Asia Professional Speakers Singapore, a member of the Global Speakers Federation. Outside of work, Robin is a die-hard ironman athlete.